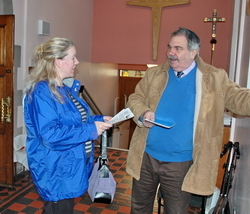 The Welcome Team in the vestibule will be able to answer any questions you have and, at our main 11.00 am service on Sundays, will also give you a service sheet. The service sheet has an outline of the order of service including page numbers which relate to the thin blue liturgy books (Scottish Liturgy, 1982) which you will find on the shelf in front of you. The service sheet also has details of the hymn numbers. You will find hymns in the green hymnbooks (NEH) or the purple hymnbooks (CG) both of which are on the shelf in front of you. Click here to see an example of an Order of Service. When to sit and stand can be a little confusing. As a general rule, the congregation stand to sing. This includes the hymns (though we remain seated for the Communion hymns, sung whilst people go forward to receive communion), and other parts of the service which are sung. We also stand at the beginning of the service for the entrance procession, for the reading from the Gospel, for the Peace, for the first part of the Eucharistic Prayer and at the end of the service as the choir and servers process out. As a general rule, we sit or kneel for prayer. For those unsure of when to sit or stand it might be helpful to sit far enough back in church to be able to see, and copy, what others do. Normally we do not pass a plate around during the service (though we do at All-Age Services and one or two other big services). Instead, there is a plate either just by the doors into church, or a little way up the aisle inside the church and you are invited to leave your donations here. The plate is taken up to the altar and the money blessed later as part of the service. 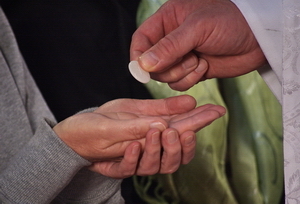 An important part of most of our services is Communion. 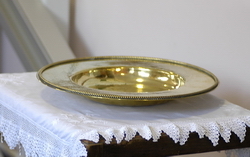 At Holy Trinity we invite all people, no matter which church or denomination they belong to, or even if they don’t belong to any church or denomination at all, to come forward to the communion rail to receive the body and blood of Christ. If you would rather not come forwards for communion, simply remain in your seat. If you don’t feel ready or able to actually take part in a service, you are welcome just to sit and watch. Likewise if you would prefer not to meet people and have a chat over coffee after the service, that’s fine too – simply turn right out of the church door, up the steps and out of the main door.